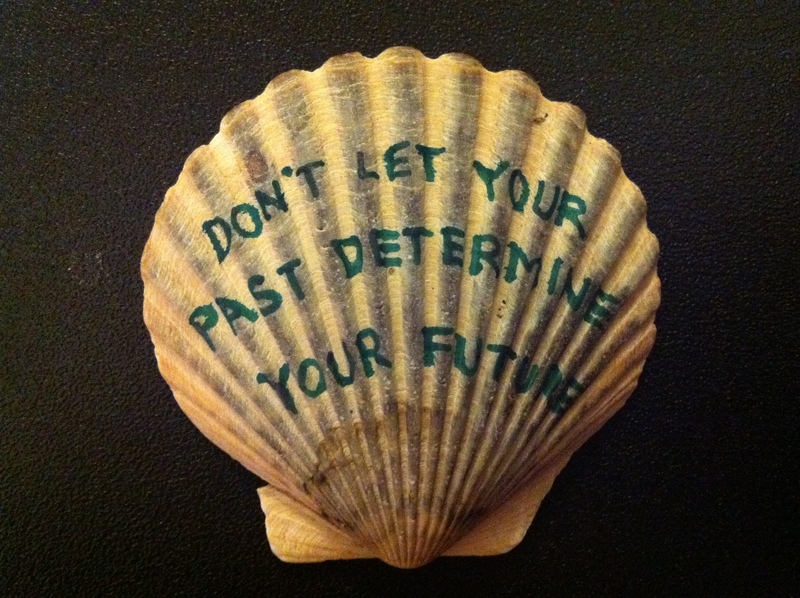 Home / Adviart Blog / Don’t let your past determine your future. Don’t let your past determine your future. The adviarter took this shell near immediately in addition to a green marker. Green is this adviarter’s favorite color–but not because of money but because of its symbolism for life. The advice is boldly written in all caps across the shell in a very neat fashion–almost a perfectionist-like tendency to the shell–a balance to the shell that is equal and defined. The advice from the adviarter coming from some trainings and coaching sessions that he had attended in the past. When I think about the past, I have worked hard to reflect upon all the lessons I have learned and what I can bring forward from experiences. The past can’t be changed and can’t be privileged in relationship to the open-ended future. The adviart makes me think of each new days as a new beginning–signaling a sense of freedom in the path that we take forward–or at least in our decision to move forward each day. This quote reminds me of someone who once told me that life is like a front windshield on a car…it is big, open, and available for looking forward but every once and a while you will be forced or choose to look back in the rear-view mirror. The question is, what do you do when you look back and how do you stay focused on the future taking all of the experience forward to improve self? I’m glad I crack windshields often–just brings some humor to the irony of a quote like this one.